Now that the average American has had daily access to the Internet for more than a decade, there have been enough stats on how printed books will most certainly survive. 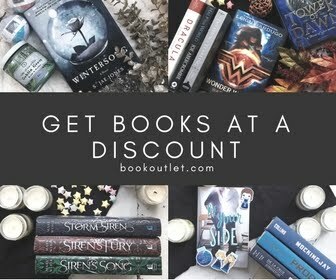 In fact, in the past four years the number of books published traditionally has increases, as many and many authors self-publish their first book, and then move to indie publishing, or traditional publishing quickly. In 2016, more than 300,000 books were published in the USA alone. 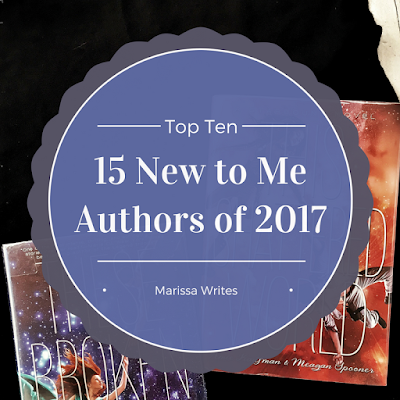 And that means there are more and more new authors to pick from. While some are hiding, and struggling, others get so big they become household names. But that isn't really a new reality, is it? When I started this book blog, I focused on those little known, or completely unknown and new authors. And it was quite the experience. New authors have fresh energy, and are fun to engage with. It brings books and stories to life in a way that cannot be explained. But in 2016 I hit a wall. All the books I picked up seemed to be dull, or predictable in a way that wasn't interesting - there is predictable like a Disney movie, you know where we love it anyway, and there is predictable like a show in syndication, where it fades into background noise right away. 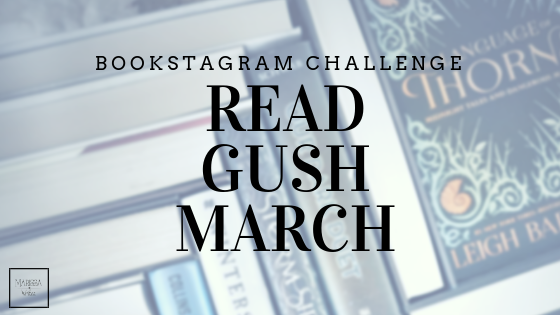 So, in late 2016, and then through all of 2017, I trusted all the amazing bookstagrammers and picked up some super popular books - I mean bestsellers, and series that have been on lists for years, and were still being added to. To be honest, it was fun. I got inspired to really dig into my own MS again and agree to edit new authors again. It was the revival I needed. VE Schwab - My lovely core Book Sorority girls convinced me to pick up A Darker Shade of Magic, and I fell in love. Granted, I only made it through book one - but I'm totally reading all the rest of her books this year! CJ Redwine- The amazing AmberAfterGlowReads suggested the Defiance series, and I fell in love with Redwine's writing in all of three pages. Leigh Bardugo - I picked up Six of Crows only after listening to some of Leigh's stories on Instagram during NANOWRIMO - she was so encouraging about committing to writing, and getting the stories out. And I'm hooked now. Laini Taylor - I cannot for the life of me remember why I ended up finally picking up The Daughter of Smoke & Bone series... maybe because it was mentioned on bookstagram a ton... but wow... and then Laini had an amazing interview at the end of the audio book... seriously love love love her books now. Rainbow Rowell - I know, everyone already knows her books, but I only just picked up Fangirl, my first RR book, and it was so fun. The contemporary YA genre, actually contemporary writing in general always fascinates me, it is so hard for me to write, so when I read a good author in the genre they get bonus points right off the start. Cassandra Clare - Yep, I know you are all laughing at me. She has been the "queen of YA" books for years now...and I only just started the books last year, in like July or something... and surprisingly, I'm enjoying them! Amie Kaufman- Another recommended author by a book buddy, and I was so impressed. Her ability to craft characters that seem to normal while living in a Sci-fi world is amazing. Meagan Spooner - I didn't even realize she had a bunch of books out when I picked up Hunted, and now I'm trying to decide where to start in devouring her work. Sarah J Maas - Well you all know how I devoured her work last year. Her books are why my husband was finally able to convince me to pick up A Game of Thrones... and she is a much better writer. S Jae-Jones - I was blessed to be part of the Wintersong release team, and this newer author is outstanding. She has a bright career in front of her I believe. Olivia Wildenstein - Another new author I was honored to work with last year. I love her ability to weave magic into her stories that make it seem like if I only travel to the right places in the world I could experience such magic too. Jay Kristoff - As a result of finding Amie Kaufman, I came across this lovely writer. I'll be honest, his style is a little dark for me, but it's a push out of my comfort zone of reading, and interesting to see how he crafts his work. Ashley Poston - Another new author that wrote a book I figured I'd just read to read, but I loved her light style. Her story was captivating, and fun like a summer click flick. Renee Ahdieh - I was convinced to pick up her books because of the lovely Elli and her enthusiasm over the stories. She was also a new style of writer for me, and it was interesting. 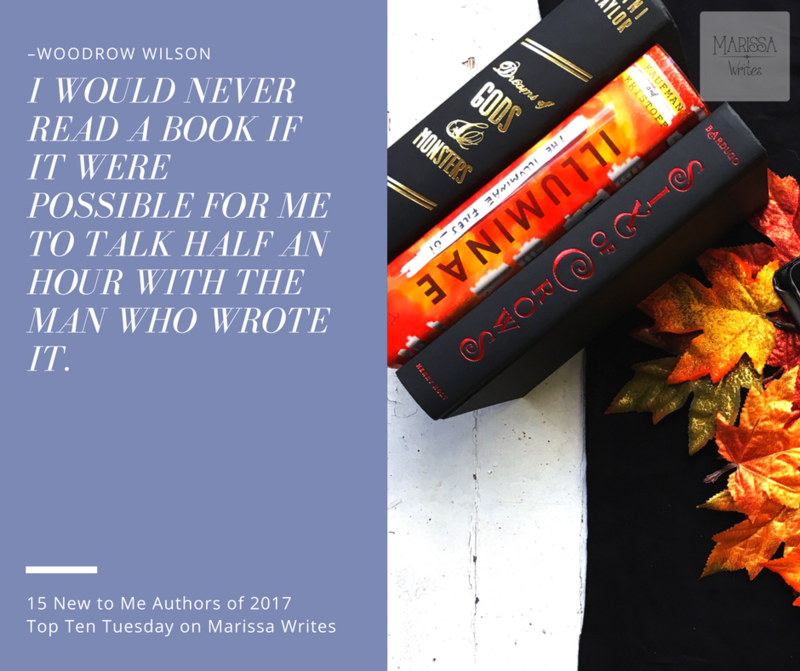 Erin Morgenstern - I had avoided this book for a long time as I tend to want books that are not as literary in style after spending years working to get a literary degree. But I'm glad I read Night Circus, it reminded me that some books are meant to sit in your mind for awhile so you can mull over the details and see new perspectives. So I mentioned 2017 was my best reading year yet, and it was. I somehow managed to read 106 books in 12 months. That's amazing. I believe I only achieved such levels of reading when I was a freshman in college and had no real life and had to read a million books for every class. This year was more about finding books that told stories that were always enjoyable. It was amazing. I cannot wait to see what 2018 holds in store for me. 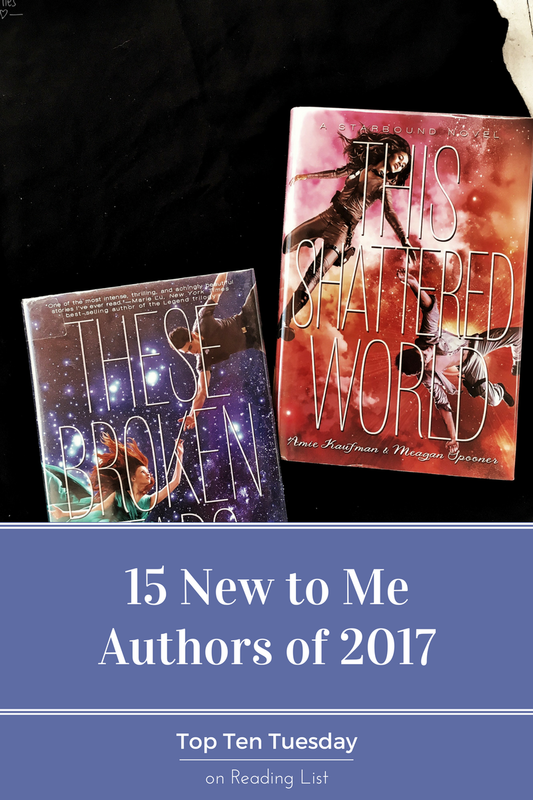 With a new year, I'm looking for some new authors to pick up. Do you have any suggestions? Don't fear if they are an older author, I might have missed them completely! 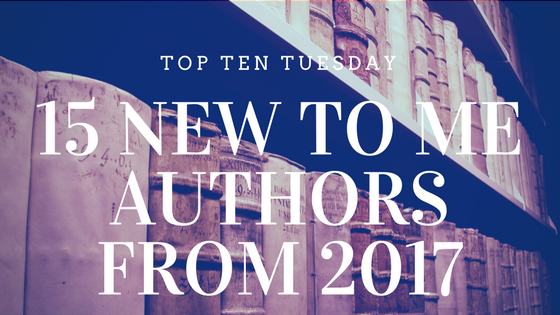 *** Check out a vast collection of other Top Ten Tuesday posts from Book Bloggers!